She invited groups not normally invited to presidential residences to visit her in Áras an Uachtaráin; from the Christian Brothers, a large religious order who ran schools throughout Ireland, but had never had its leaders invited to the Áras, to G.L.E.N., the Gay and Lesbian Equality Network. She visited Irish nuns and priests abroad, Irish famine relief charities, attended international sports events, met the Pope and, against pressure from the Taoiseach, Charles Haughey, not to do so, was the only head of state to meet the 14th Dalai Lama during his tour of Europe. She put a special symbolic light in her kitchen window in Áras an Uachtaráin which was visible to the public as it overlooked the principal public view of the building, as a sign of remembering Irish emigrants around the world (placing a light in a darkened window to guide the way of strangers was an old Irish folk custom). Robinson's symbolic light became an acclaimed symbol of an Ireland thinking about its sons and daughters around the world. She visited Rwanda where she brought world attention to the suffering in that state in the aftermath of its civil war. After her visit, she spoke at a press conference, where she became visibly emotional. As a lawyer trained to be rational, she was furious at her emotion, but it moved many who saw it. One media critic who had slated her presidential ideas in 1990, journalist and Sunday Tribune or Vincent Browne, passed her a note at the end of the press conference saying simply "you were magnificent." 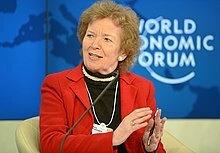 In October 2016, it was revealed in the media that Robinson was planning to donate her archive to Mayo County Council, as part of the development of The Mary Robinson Centre, and had applied to have the archive designated under the Taxes Consolidation Act, 1997, potentially resulting in a personal tax cr to her worth over €2m, arising from the donation of her personal papers. The house proposed to be used for the centre was to be purchased from the brother of Mary Robinson for €665,000. Following the reporting of the potential €2m windfall, Robinson announced she would abandon the plan to "gift" the archive to Balllina and instead she said the papers would be "gifted to NUIG, with Mayo County Council having full access to any part of the collection which is required to support the mission of the centre in Ballina". In addition she stated that she would now not avail of the tax cr for the donation.